“Developmental disorders” are among the most common problems in younger children. Some caregivers who have children with developmental disorders are aware of their child’s difference before the age of three. Regardless of a positive or negative diagnosis, the reality that such children live in does not such as children may not adapt well socially). Of course, they would not receive any understanding or support without a diagnosis and there is also no doubt that they will have a harder time in later life. 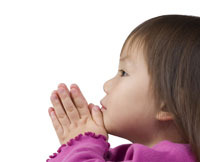 Therefore, it is an urgent need to provide appropriate support for those children at a proper time. １． Do these children have delayed development? ２．How do they differ from children with standard development? ３．Are there any unexpected signs? The most common symptom of problem children is developmental delay. Usually, the severity of the delay is assessed by comparison with typically developing children of the same age in months. It is necessary for caregivers to have better knowledge of child development according to daily life, and have an objective understanding of child development using child development scales. ３. Whether any unexpected signs can be observed? Physical symptoms such as tics and physiological symptoms such as convulsions are usually observed. In such cases, the doctor’s diagnosis and appropriate support based on the diagnosis may become necessary. However, do not confound developmental difficulties with developmental disorders and regard such children as disabled. Our purpose is to figure out whether the children need support and then deliver appropriate support for those who need it in practical situations. 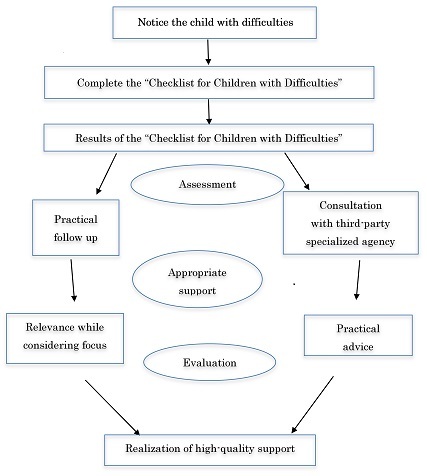 When you have finished logging the data of the “Checklist for Children with Difficulties,” there is no need to match every item with a certain diagnosis. It is important to understand the trend of the items with reference to the background factors.of problem children Moreover, multiple perspectives, such as those of the data recorder and childcare professionals with practical experience, should be obtained to understand the child’s tendencies and devise proper strategies. However, we should also know that psychology and medical professionals’ jobs are usually to make such assessments. Practically, limitations do exist when we want to determine tendencies and strategies. Sometimes, the limitations are only present in a single institution; perhaps in other professional institutions in the community, the limitations can be overcome. Thus, it is also important to cooperate with other institutions in order to provide high-quality childcare support. Two-year old AI began her nursery school life at birth. She was born with a normal weight, no problems during the delivery, a nice and responsible mother, and no obvious family conflicts. However, AI was often quiet, insensitive to sound and light, and had high sleep quality, and surprised others with her slow development compared with other children. She could not walk even when she was one year old and her vocabulary development was slow, but she always smiled, so she brought little attention to her speech difficulties. But when she went to her 18-month-old child health checkup, she was found to have several worrying symptoms: her muscles were soft, she still could not walk steadily, and she had trouble pointing at objects and expressing what the object was in words. She was diagnosed with general development delay via a detailed examination at a local childcare consulting office. AI ’s mother was encouraged to participate in the mother?child classroom at the mother and child healthcare centers in the community; however, the mother could not participate because of work at that time. After the diagnosis, the mother became anxious and worried about AI ’s development. She wanted to do everything for AI , but also she was worried about her financial situation if she quit work, so she came to the nursery school for advice. After consultation with professionals, they decided to seek a way to promote AI 's development. First, AI did not like to move and often sat; as such, we needed to create an environment that would encourage her to move. When we brought her to play outside, we focused on encouraging systemic movement, such as walking hand-in-hand, holding a doll with her fingers, picking something up on her own, rhythmic gymnastics of gradually increasing intensity, and general stimulation. Moreover, we focused on promoting communication and emotion sharing with peers and listening to her teacher tell fairy tales. In this way, she was able to learn words and how to make simple conversation. When she became a member of the 3-year-old class, even though fewer teachers were provided, she was supported by a special education teacher to help her as a child with developmental difficulty. Everyone’s developmental pace varies. Based on the understanding of individual differences, if the child is diagnosed with development delays compared to other children, it is necessary to change the environment to benefit the child’s development. First, we must understand the child’s situation by assessing children with possible development delay. In addition, if the delay level appears very severe, further examination in child healthcare consultation centers should be performed. As a follow-up solution, attending parent–child classes and language training is suggested. However, for some parents who work full-time, taking part in such classes can be difficult. Therefore, it is important to cooperate with schools to utilize schools’ resources to empower children's development. Regarding the fewer teachers in 3-year-old classes, some regional governments have developed policies for children who need special care such as providing regular consultants and special education teachers for them. BT is a 3-year old child who enjoys nursery school life and comes to school on time. She impressed us with her activity and cleverness, and she went everywhere in the nursery school. She especially likes to play with the computer in the director’s office. While she often ignored others’ speech and made no eye contact, sometimes she spoke to her preferred teacher and walked out hand-in-hand. She was not good at getting along with peers; if she could not leave the classroom, she often hid herself under the teacher’s desk and covered her ears. She was good at block play, as she could build complex structures that other children could not make, so other children admired her to some degree. She only ate meals that she preferred, and for food that she enjoyed, she would even eat others’ shares. She sang songs, but did not talk with other children. On one hiking day, she panicked and did not participate because her bag was exchanged with a rucksack. In the 3-year-old health checkups, she was found to have difficulties with hyperactivity, social relationships, and communication; she was diagnosed with pervasive developmental disorder (autism) at the children’s hospital. She was advised to undergo training at rehabilitation facilities and in rehabilitation groups, but because of her mother’s working schedule, she was only able to go to language training one day a week. In the nursery school, considering the regular consultant’s advice, it was recommended that teachers attempt to create a relaxed and happy environment for B-chan. Children with pervasive developmental disorders sometime have unusual reactions to audiovisual, skin, and taste sensations, so the nursery school should provide a calm environment and avoid stimulation or changes to the environment. The director’s office was left as an oasis for BT and used as a break room for her when the classroom was noisy. We ensured that there would be no changes in her daily routine, or if it was necessary, advance notice would be given. Verbal instructions were reduced and expressed with the help of paintings and models. In setting play scenes, we made sure to provide B-chan with more chances to enjoy communication and share her experiences of handmaking. With these changes, BT no longer left the classroom without permission or hid under her desk, and began to move at the same pace as her peers. She also seemed to be more relaxed. Moreover, she began to use more words and was able to engage in simple conversations with others. She began nursery school at an expected status. Children whose behavior deviates from that of other children tend to have difficulties in social interactions because of their specific characters. Such children grow up with what they experience and learn during these interactions; however, some temperaments remain hard to change. The behavior features of children who have developmental disorders are especially easy to misunderstand; their effort and home discipline are often insufficient but difficult to improve. If they cannot gain understanding from others, it may trigger bullying and quarrels during school, which will further hurt these children and cause them to gradually lose confidence. It is a key point that professionals identify their deviations as early as possible and provide a relaxed environment for their development. Thanks to early observation, BT not only began to engage in rehabilitation, but also was able to rectify her problem behavior and improve development through environmental adjustments.